Realizing effective listening behavior in virtual humans has become a key area of research, especially as research has sought to realize more complex social scenarios involving multiple participants and bystanders. A human listener’s nonverbal behavior is conditioned by a variety of factors, from current speaker’s behavior to the listener’s role and desire to participate in the conversation and unfolding comprehension of the speaker. Similarly, we seek to create virtual humans able to provide feedback based on their participatory goals and their partial understanding of, and reaction to, the relevance of what the speaker is saying as the speaker speaks. 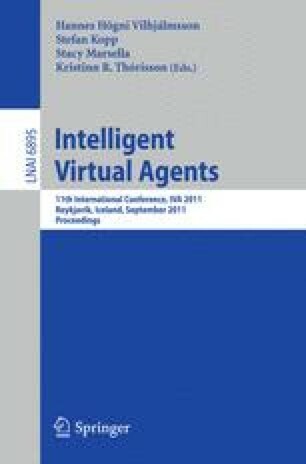 Based on a survey of existing psychological literature as well as recent technological advances in recognition and partial understanding of natural language, we describe a model of how to integrate these factors into a virtual human that behaves consistently with these goals. We then discuss how the model is implemented into a virtual human architecture and present an evaluation of behaviors used in the model.